The right music doesn't soothe the savage beast, it makes the beast more savage. When you're going for a long run, that's exactly what you want. The pulse of thumping beats can make you feel superhuman. It certainly beats the sound of your own labored breathing. But all earbuds are not created equal. Some refuse to stay in your ears. Some have no dynamic range. Some are like small torture devices. So we took five of the best workout earbuds and put them to the test. Meet the new king of your sweaty ear canals. Welcome to Fitmodo, Gizmodo's gym for your brain and backbone. Don't suffer through life as a sniveling, sickly weakling-brace up, man, get the blood pumping! Check back on Wednesdays for the latest in fitness science, workout gear, exercise techniques, and enough vim and vigor to whip you into shape. In order to be considered, the products had to be earbuds, not headphones. 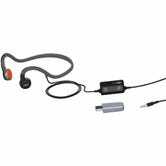 Sure, you can get better audio fidelity with larger, over-the-ear phones, but they're heavier, bulkier, hotter, and just not practical for working out. They also had to be tough. Sweat-proof, water-resistant, and build quality were taken into account. Last, they had to cost under $100. There are plenty of better, pricier earbuds out there, but these things are going to be banged around at the gym, soaked in sweat, dropped, lost, and maybe stolen. 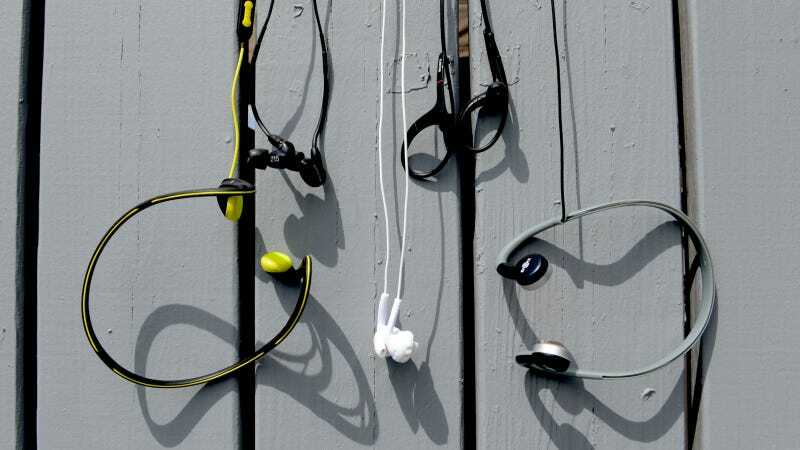 Each earbud was worn on runs that covered park and street conditions. We also wore them doing pushups, sit-ups, jumping jacks, and using a punching bag. Then we just shook our heads around, trying to dislodge them. Each was also tested on a wide range of music in a quiet room—you know, for yoga poses. 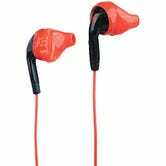 Comfort, stability, durability, volume, and sound isolation played key roles, in addition to straight-up sound quality. The Sonys were the lightest of the headphones we tested and arguably the most comfortable. The cord loops back over your ears and then tightens to keep them from falling off. They are sweat-proof and water resistant—you can even rinse them off after each workout. They are designed to block external noise, which is nice for creating a little bubble of sound, but you lose some situational awareness, so there may be some safety issues. The AfterShokz use a different technology from the others: bone conduction. This means that your ears are left completely uncovered, and sound is actually pumped in through your cheekbones. This gives you a ton of situational awareness. Running down the street you can hear your music clearly while still being able to hear people talking at a normal volume (not to mention cars trying to run you over). The behind-the-neck design keeps the AfterShokz firmly in place no matter how much bouncing we did. Plus, they feel cool and futuristic. 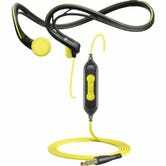 The yurbuds, with their Twistlock design, stay in your ears like nothing else. You could headbang your face off, but they won't fall out, and they're actually pretty comfortable. They're very lightweight, and their unique shape actually lets in a fair amount of ambient noise, which may help you avoid hazards. Sweat-proof and water resistant, and they feature a mic with three buttons for taking calls, skipping tracks, and adjusting audio, which is handy. The Shure SE215 has been the budget pick for many an audiophile. Indeed they have the highest quality, most balanced sound of any of the buds we tested. Highs and mids were clean and distinctive and there was an acceptable amount of bass for our hip-hop. Now, these aren't created to be sports earbuds, however, because of the unique shape of the drivers and the way the cables loop behind your ears, they stay in very securely. Most earbuds just have silicone tips, but these are silicone filled with foam, and they provide more sound isolation than any of the others (which is good for airplanes, but bad for street-running safely). If you're an athlete with a penchant for sonic fidelity, these are your pick. 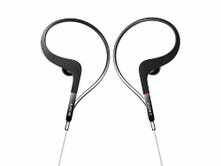 The 680 Sports series from Sennheiser/Adidas simply give you the most boom for your buck, and by boom I mean bass. These pack some of the heaviest bass I've heard on earbuds, and they're loud, too. I was able to turn the volume down several notches compared to the others. The neckband design means that they didn't budge even slightly when running or doing jumping jacks. They're light and they have a built-in mic with start/stop and volume controls. They're sweat-proof, water-resistant, and rinsable. They let in a bit of ambient noise, but because they can go so loud it's easy to overwhelm it. While it isn't the cleanest sound, the 14mm drivers have enough bass to give it a full sound. If you're trying to run to a beat, these are the ones.